I have a Domain Name!!!! It’s time to choose a domain name that can represent your digital self. You can’t (and shouldn’t) pick just anything. It has to be unique and available. It should be relevant – it could be based on your real name, a nickname, just something meaningful to you. You will need to search for its availability using a domain registrar and you can pick from a number of different ‘top level domains (TLD)’ – for example .com, .net, .us, and .org – then you can have mypersonalsite.net. If you’d like to try to do something clever you can work with a TLD like .es and create a ‘domain name hack,’ in which the entire domain makes up a word for example – sleepswiththefish.es. Here’s a little additional advice as well as examples of students picking domain names from ds106.us. You’re also going to need web hosting, which will allow you to put files up online and will be discoverable through your new domain name! We are going to use a form of ‘shared hosting’ where you get a portion of a server – think of it as having an apartment in a building. With this shared hosting you will be able to do a lot of things including installing your own instance of WordPress so you can start your website for your domain name. We use a company called Reclaim Hosting, with which we have a contract so you can enter a coupon code and start your account for free. 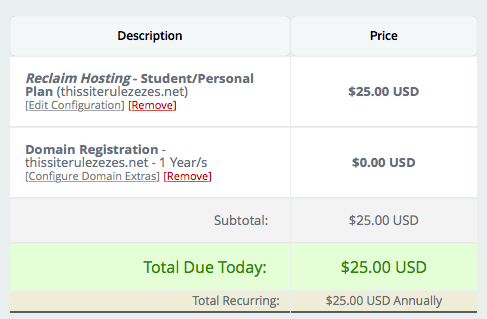 We chose this company because they have a lot of experience working with students just like you, that are likely getting their first domain name and web hosting account. You create an account just like you would with any online vendor with which you want to purchase something. So it’s not a ‘CUNY’ account, we’re just giving you the coupon code to pay for the year’s service. With that said, you will need to provide a name, address, and phone number. Go to this sign-up page to get started. 1. First you will need to pick your domain name. 4. Your total should now be $0. If it is not then check the items and your cart and adjust. 6. Complete the order and check your email for your account information. With your new account information, log-on to Reclaiming Hosting. 7. 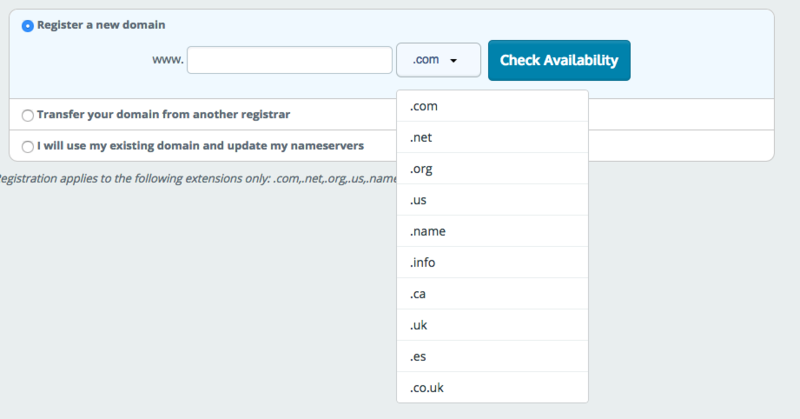 Look for the Domains Tab, and check your domain name information. Enter that information in this form. 8. YOU ARE ALL SET AND READY TO START WORKING WITH YOUR NEW DOMAIN NAME AND WEB HOSTING ACCOUNT! YAY!!!!!! 9. TIME TO INSTALL WORDPRESS. HERE’S A TUTORIAL RYAN AND I MADE LAST YEAR. Next Next post: Computer graphics project Sneak Peak!